So forgive the snapshot photo, but I was too hungry to take time to take a picture of the rice by itself. I literally inhaled my dinner last night. This side is so easy and yummy to make. Like I have said before its mind over matter, but when your mind is too stubborn its about trickery!!! 🙂 Enjoy!!! 2. Place cauliflower in microwave for about 7 min. I did 4 because I only had a handful of florets. I place the damp paper towel I used to dry off the cauliflower over the bowl. 3. Test cauliflower with fork to see if it tender and easily breaking apart. 4. 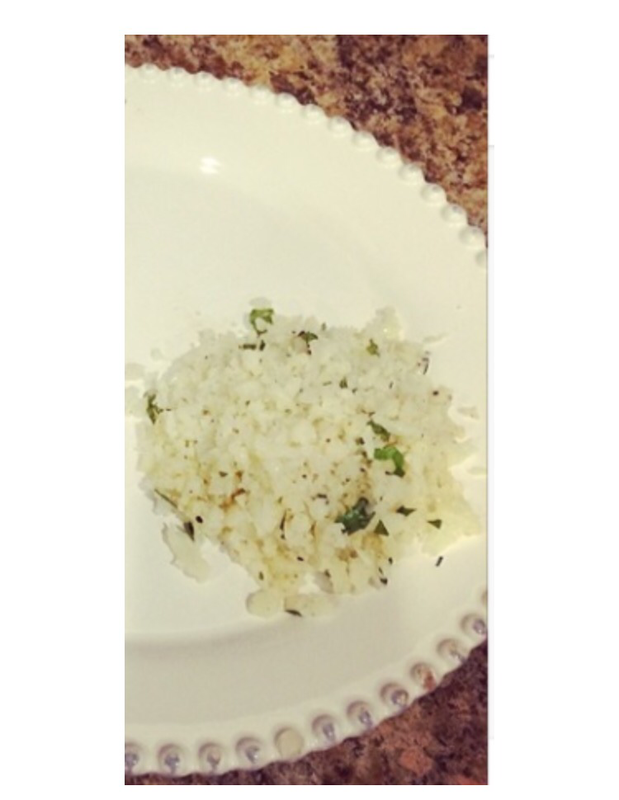 Place cauliflower in food processor and pulse until it shreds to look like rice. 5. Heat medium size pan on med/high heat. 9. Cook cauliflower until it starts to brown a bit. Add sat and pepper to taste… heck throw in some garlic if your feeling frisky. 10. Dish this scrumptious stuff out and add herbs and voila!